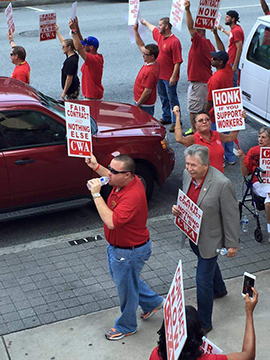 CWA President Chris Shelton and District 3 Vice President Richard Honeycutt joined nearly a thousand CWAers at an informational picket and rally outside AT&T headquarters in Atlanta this past Saturday. CWA President Shelton marches with CWAers at AT&T rally in Atlanta. "The only reason this company is successful, the only reason it can buy DirectTV or companies in Mexico, is because the people here today break their backs every day to make this company successful," President Shelton said. "You should be extremely proud of the mobilization and the solidarity that you show, not only by being here, but every day since bargaining started. That's what's going to get you a contract. We can do all the yelling we want. If management knows you're behind us, they're going to have to move, and they've already started moving, because they knew this rally would be a tremendous success," Shelton told a sea of red-shirted CWA members at the rally. Watch some video of the rally here. AT&T workers in CWA District 3 turned out in force to tell AT&T that they will not accept higher health care costs, unsafe working conditions and other concessions that the company is demanding. CWA members in nine Southeastern states are working without a contract; negotiations continued this week. More than 1,000 CWA members marched and rallied outside AT&T headquarters. Vice President Honeycutt said, "Our bargaining team has been working hard for over two months to reach an agreement but it seems that AT&T is only interested in one-sided negotiations. We have seen an unprecedented amount of mobilization activities throughout District 3 and our members have proven that they are willing to do whatever it takes to secure the contract they deserve." CWA Local 3204 President Ed Barlow said the way AT&T has gone about bargaining has shown members how much they need their union. "AT&T, we are here to let you know today, we are not playing in Atlanta, GA," Barlow said. "We will fight to win contracts that honor our sacrifices for this corporation. It's our turn." AT&T is a very profitable company, with profits last year of $6.5 billion and second quarter 2015 revenues topping $33 billion. AT&T also recently completed a $48.5 billion acquisition of DirecTV.